At the Cuban Art Space (CAS) our mission is to educate the U.S. public about Cuban art and culture, promote the work of Cuban artists. Cuban art is still very little known in the United States, especially that made by artists still living and working in Cuba. CAS works toward the resumption of full educational and cultural exchanges between our two countries. Given the decades-long break in relations between Cuba and the United States, these are not easy tasks. But we start with a distinct advantage: the Center for Cuban Studies has been sponsoring cultural ex- change programs for many years and in those years has accumulated a collection of several thousand art works – paintings, drawings, sculpture, posters and prints, photographs, handmade books, and crafts. In 1991 the Center spearheaded a successful lawsuit against the U.S. Treasury Department. 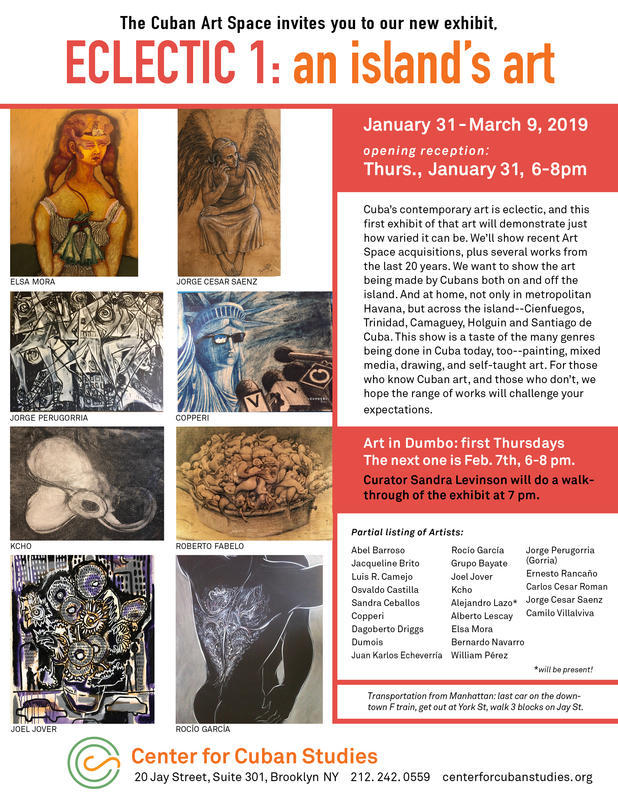 This made the importation and sale of original art from Cuba legal, and in 1999 the Center opened its own gallery, the Cuban Art Space. In the pages of this website, you’ll be able to see for yourselves the reason we love Cuban art, from self-taught and “outsider” art to trained and sophisticated art. The Cubans do it all, and many of the best artists work in several mediums.